It’s a Cracked Magazine cocktail party, from Cracked #241, December 1988. 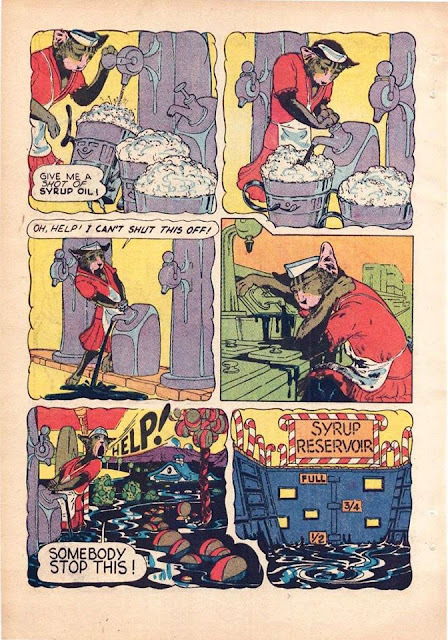 The magazine was at that time under the editorship of Mort Todd and featured Todd and Dan Clowes’ Uggly Family strip, as well as contributions from Weirdo editor and Neat Stuff/Hate creator Peter Bagge. 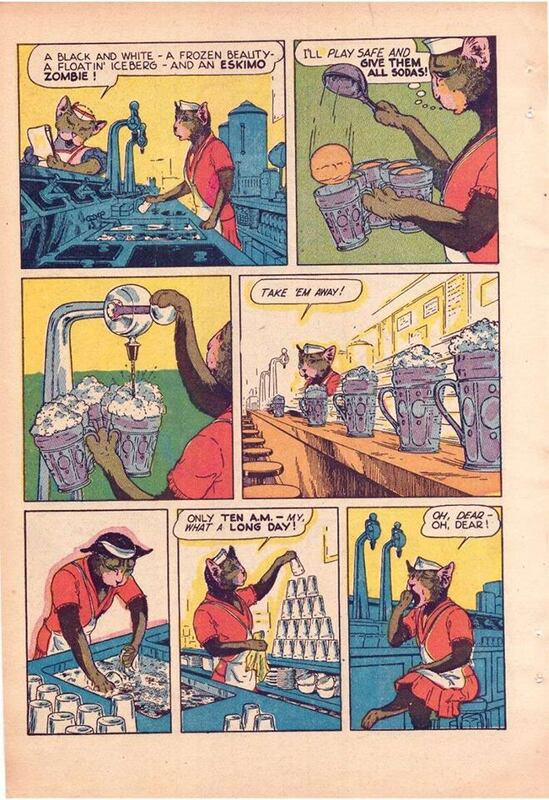 Doofus creator Rick Altergott was a regular as well. These guys comprised the “kids’ table” at this memorable meeting of the minds that also featured all-time greats like John Severin, Don Martin, Don Orehek, Bill Wray, and many more. Great to see photos of these past and future giants in a casual, but work-related setting! 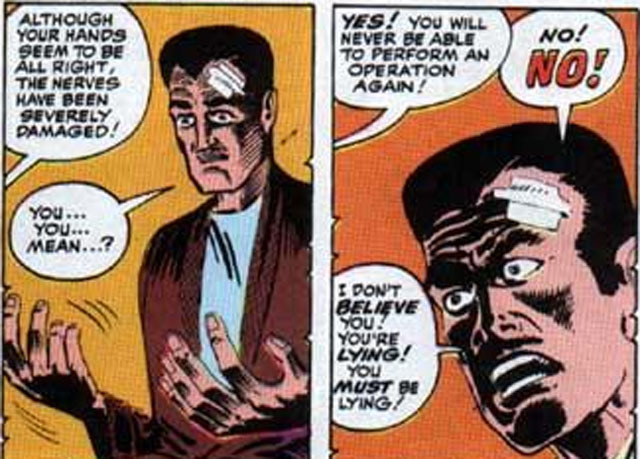 There's an interesting echo of the origin of Steve Ditko’s Dr. Strange in one of the more famous episodes of Seinfeld, 1993’s “The Puffy Shirt”. 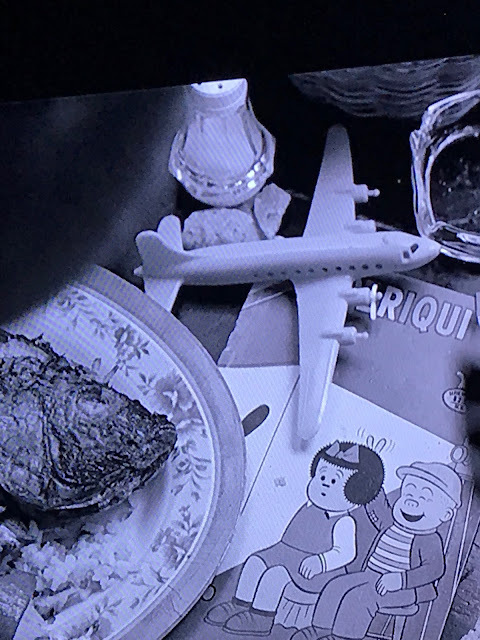 In the episode, written by Larry David, sad sack George rockets to the top of the hand model game, but just as he feels his life is turning around, his brief career is cut short when his hubris is rewarded with inevitable destiny in the form of a carelessly-placed clothes iron. 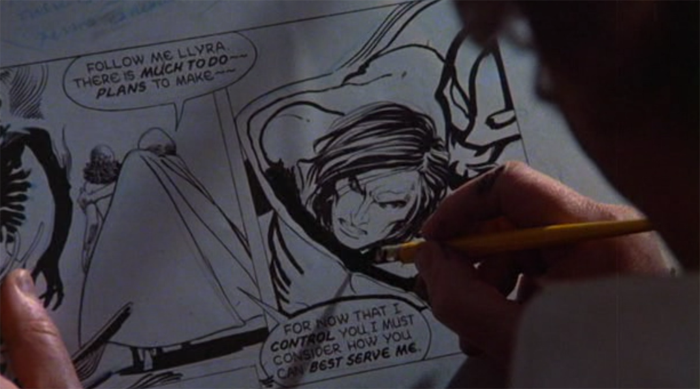 George’s vanity is reminiscent of that displayed by high-flying surgeon Stephen Strange, who destroys his precious hands in a car accident and subsequently wanders the world searching for a cure that can restore his skill and dexterity, until he eventually winds up at the hidden Himalyan monastary of the Ancient One who trains trains him in the mystic arts. MAN: Tragic story, I'm afraid. 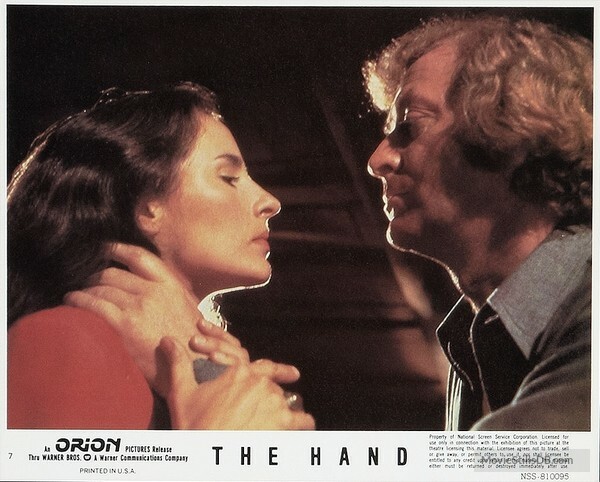 He could've had any woman in the world.. but none could match the beauty of his own hand.. and that became his one true love..
MAN: (Quick, to the point) The muscles.. became so strained with.. overuse, that eventually the hand locked into a deformed position, and he was left with nothing but a claw. (Holds hand up, displaying a claw-like shape) He traveled the world seeking a cure.. acupuncturists.. herbalists.. swamis.. nothing helped. Towards the end, his hands became so frozen the was unable to manipulate utensils, (Visibly disgusted by this last part) and was dependent on Cub Scouts to feed him. I hadn’t seen another pair of hands like Ray McKigney's.. until today. You are his successor. (George looks down at his hands) I.. only hope you have a little more self-control. 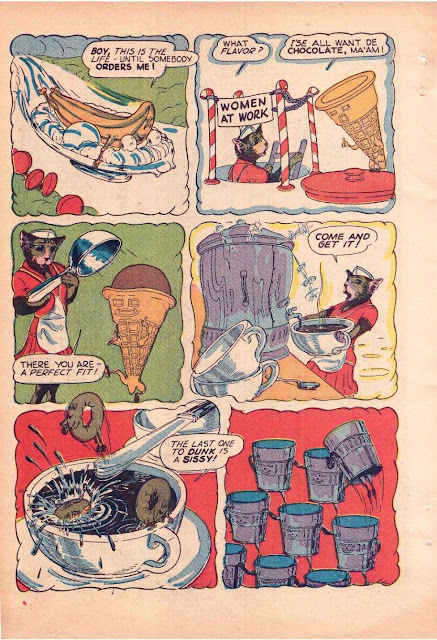 The monthly series began publication in 1960 and each issue consisted of 32 full-colour pages. The dimensions of the comics changed beginning in March 1975 due to the rise in the cost of paper, forcing the publisher to reduce the size of its comics by almost half to 19.5 x 13.5 cm from 25 x 17 cm (this is when the "Eagle Series" logo appears). Some stories may have been written and drawn by Mexican creators. 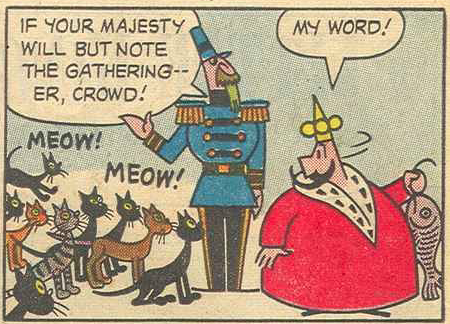 I think the consensus is that the Little King comics published by Dell were written and thumbnailed by John Stanley of Little Lulu fame. 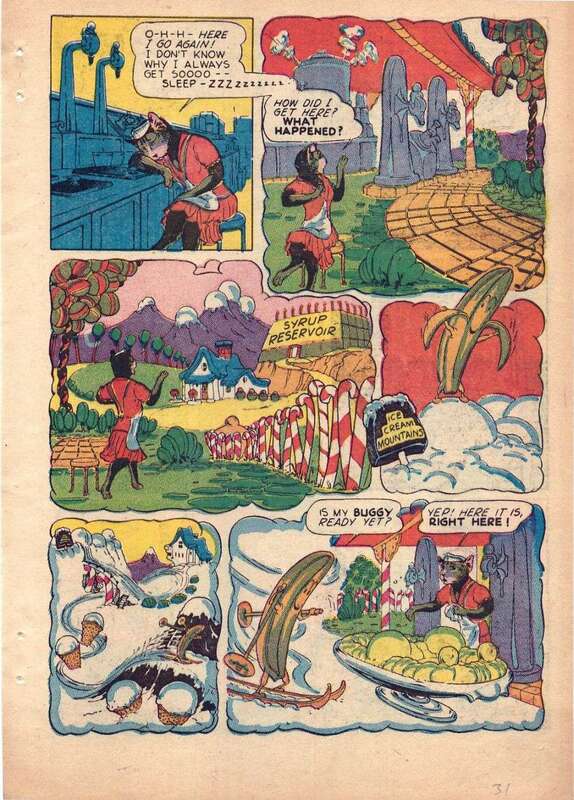 The Little King is one of the most iconic of comic strips and its creator, Otto Soglow, was a great cartoonist, beloved of little children and adult intellectuals alike (Salvador Dali was his biggest fan). The Dell comic book adaptations, signed by Soglow but not by him, are also great. 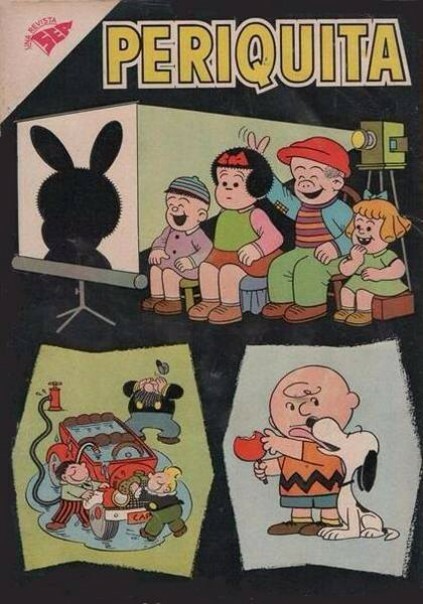 These comics are playful and actually funny, with a great graphic aspect that echoes the comic strip in its use of geometric shapes, contrast and wonderful compositions. Just beautiful. I bought this from a toy vendor this weekend not because I like these comics but because I don't have any of this particular type. 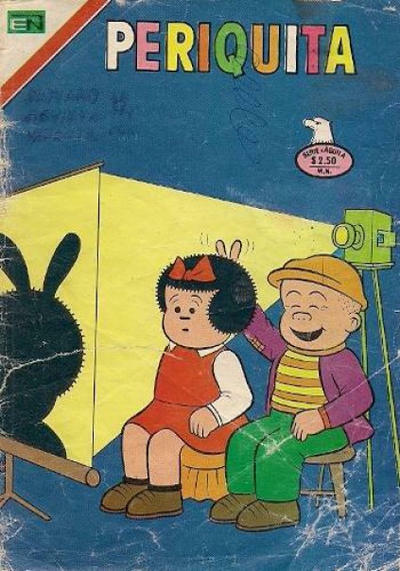 You hardly see these Canadian editions of Dell Comics (I wish it was a Little Lulu!). Less pages than the U.S. issues and blank inside covers. Subscription coupon on the back cover. Published by The Wilson Publishing Company, 123 Eighteenth Street, New Toronto. 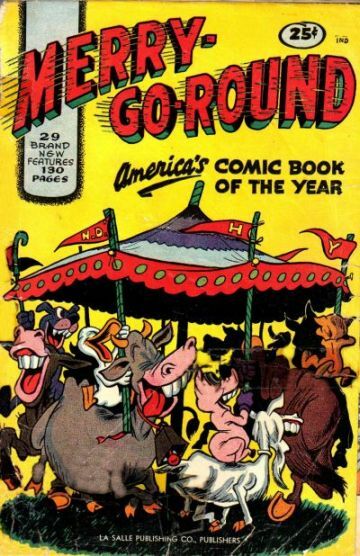 Established during the WECA embargo on U.S. comics, the company kept chugging along until I believe the Comics Code came along. More on this postwar period of comics publishing in Canada. 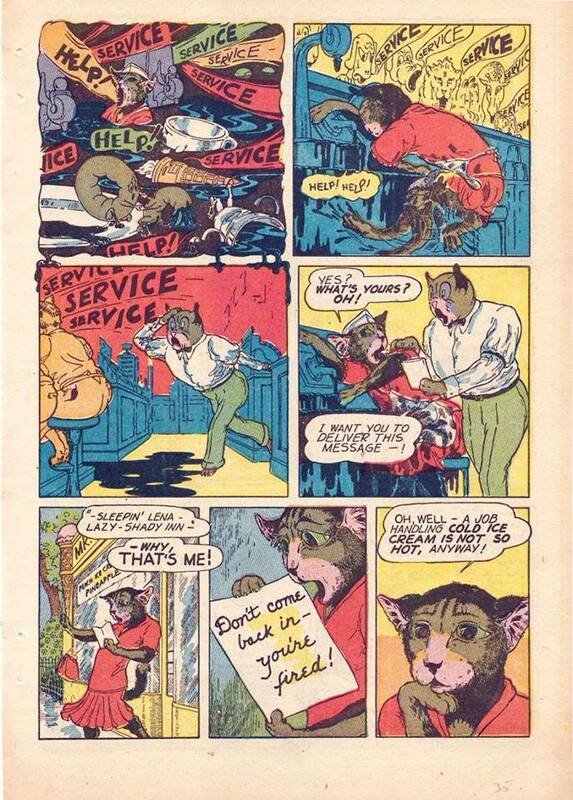 My new favourite comic book character is Sleepin' Lena, the anthropomorphic lady cat afflicted with hypersomnia. Lena was written and drawn by Erich F.T. 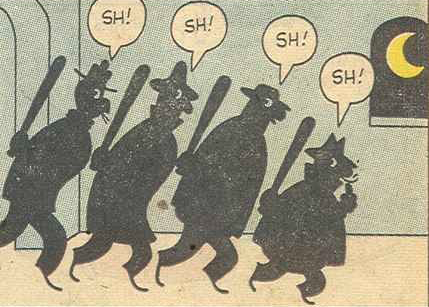 Schenk, an American journeyman cartoonist who worked for a variety of publishers in the 1940s, and also for the Fleisher animation studio, where he provided surreal background paintings for Popeye and Betty Boop cartoons. 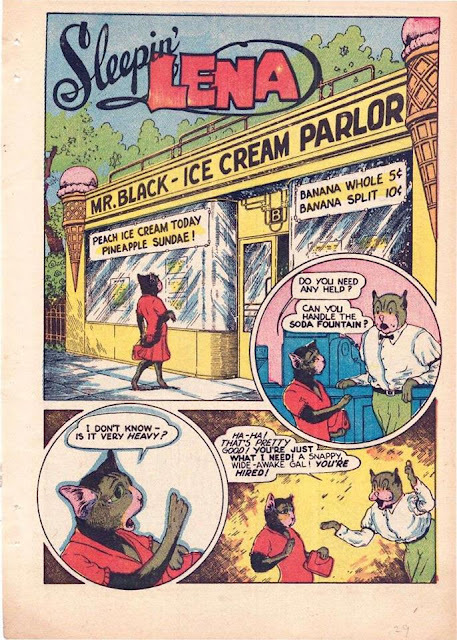 Lena appeared in only a handful of stories in different titles. In each story, Lena gets a new job but falls asleep and has a dreamlike adventure before getting fired. I love the character especially because of this story where she is hired as a soda jerk in a candy store, just like my store! A truly weird character at the intersection of race and gender. The comics historian Cheryl Spoehr has posited that Lena is a literary "type" based on stereotypes of people of colour, especially broken down maids, found in popular American books and other media of the early 20th Century. Perhaps the name is borrowed from Lena Horne, who was at the height of her early success in the 1940s? I came across an auction for this postcard on Ebay. The seller is a stamp dealer and apparently bought this as part of collection featuring famous and not-so-famous cartoonists. It looks like the sort of project a fan or hobbyist (or burgeoning cartoonist) would do, writing away to every cartoonist with a public address and asking for a free sketch. 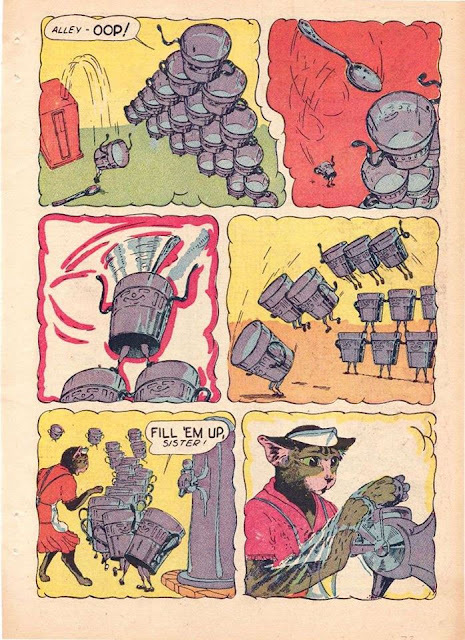 The collection comes from Abilene, Texas, which makes it all the stranger that the collector tracked down the totally unknown cartoonist Joseph "Joe" Cranswick of Vancouver, British Columbia. 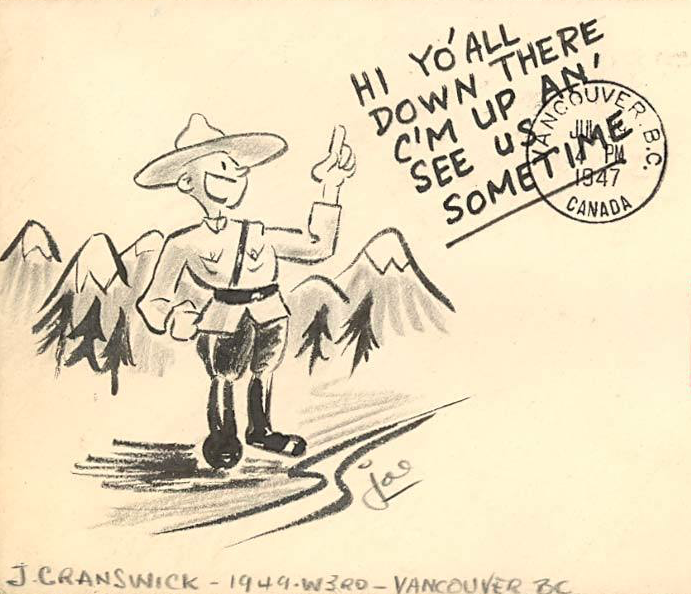 Joe Cranswick was a newspaper cartoonist, but for what Vancouver newspaper I'm uncertain. The card is postmarked 1947, so he must have been at work there at that time. In later years (through the 1960s) he was the editor of Thy Kingdom Come, a magazine published by The Association of the Covenant People, to all appearances a Vancouver offshoot of the Christian sect of British Israelites, which still has a church in Burnaby, BC. (There was a Joe Cranswick who worked as a CBC technician in the 1960s and 1970s in Burnaby as well, but I'm not sure if he's the same). The address on the card still exists in Vancouver. I just started on this mystery, so it's still a work in progress.